We provide beauty products for women and men of all ages. 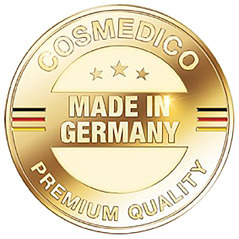 Our products are clinically tested and produced in Germany. With the serum Cosmedico Hyaluron Pro Beauty Fluid with Collagen Pro Beauty Lightwave Appliance tabletop unit to get a professional treatment at home. Our serum works just fine without light treatment but faster effkt achieved when combined with phototherapy. Read more in our products.